Tyler Scholl brings it home in third against as tough field. 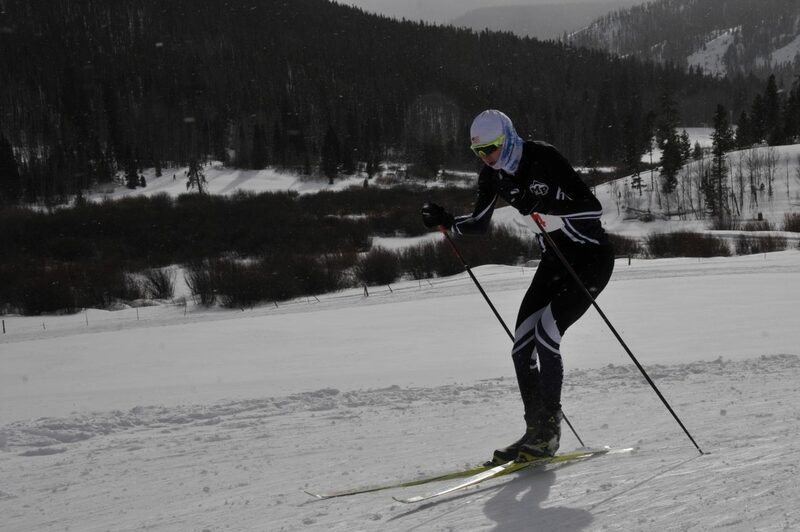 GRANBY — The Middle Park High School Nordic Team did not have to travel far for their pursuit race on Saturday, Jan. 26, taking on the largest fields of the season at home base, Snow Mountain Ranch. The weather forecast did not predict the blowing conditions and frigid temperatures that faced the 14 men and six women of Middle Park for a fast 3K individual start classic race in the morning followed by a 5K pursuit start skate race in the afternoon. “With both coaches busy attending to dozens of extra tasks involved in hosting such a large event, our athletes really stepped up and took care of themselves today,” shared Assistant Coach Dave Cleveland. The athletes’ parents impressed the coaches as well, helping with setup, course prep, timing, administration, cleanup, and more. “It was very gratifying to see them all pitch in to give our hundreds of guests a world class Grand County racing experience” said Cleveland. Busy race director Laura Cleveland shared, “I want to thank every volunteer who was willing to take on any job asked of them. I couldn’t be more grateful for every single one who helped make this race day a success,” said Cleveland. Led by Tyler Scholl’s fourth place finish in 11:04, the MPHS men continue their climb up the standings, finishing second by just four points to winner Summit. Also scoring points for MPHS were Sebastian Brower in 6th with a time of 11:22 and 13th place finisher Alex Holinka in 11:50. Showing the incredible depth of the team, the next six Middle Park racers all finished with one minute of each other: Kimo Sullivan 31st (12:31), Guy Gordon Granger 32nd (12:43), Ethan Callarman 34th (12:50), Isaiah Callarman 41st (13:05), Wil Cleveland 47th (13:19), and Vinny Troccoli 48th (13:20). Also cracking the top 100 were Graydon Walker in 67th (13:57), Will Kuhns in 76th (14:17) and Aaron Sanders in 82nd (14:44). Freshmen Chance Hein (17:04) and Jack Nesvara (22:26) continue to improve their performances each week. The men’s field of 161 was one of the largest in CHSSL history. The women’s team finished a strong fifth out of 14 schools as 113 women took on the short but challenging course. Senior Elizabeth Barker led her small but talented team with an 8th place finish in 14:02 followed by freshman powerhouse Elizabeth Hammond in 29th (15:28). Junior Selena Stoncius continues to shine this year finishing 48th (16:34) with classic specialist Katelyn Cimino next in 50th (16:38) and Maggie Barker in 58th (16:53). Freshman Sierra Jamison rounded out the team in 86th (19:28). After resting and refueling, the men returned to the course for the longer 5K skate race which took them up around Columbine Point followed by a fast descent down Milligan. In the pursuit start, racers started in the order and with the same time delay that they finished the morning race, chasing the racers who beat them earlier. MPHS finished third, edged out by Aspen and Durango. In spite of recovering from illness, Tyler Scholl made the podium, finishing third in a time of 14:11, just 11 seconds off the winner Everett Olson of Aspen. Sebastian Brower gave another powerhouse performance in 11th with a time of 14:53, and sophomore Ethan Callarman had a career-best race, scoring points for MPHS in 19th (15:31) even with a crash at the finish line. The “fast pack” came next with Kimo Sullivan in 23rd (15:45), Guy Gordon Granger in 26th (15:50), Alex Holinka in 27th (15:52), and Vinny Troccoli in 28th (15:56). Wil Cleveland brought it home in 35th (16:09) in spite of a fall on the course followed by Isaiah Callarman in 52nd (16:54), Graydon Walker in 53rd (16:54) and Aaron Sanders in 75th (17:54). Will Kuhns (21:01), Chance Hein (21:48) and Jack Nesvara (26:11) rounded out the Middle Park effort. The women climbed a notch to fifth in the team competition, once again led by senior Lizzy Barker in 12th in 18:26 with Elizabeth Hammond just behind in 13th (18:35). Fueled by a disappointing classic performance due to a late start, sophomore Maggie Barker had a career-best performance as she scored points in 24th (19:24). Also skiing well were Selena Stoncius in 53rd (21:20), Katelyn Cimino in 54th (21:37) and Sierra Jamison in 64th (23:06). The team hits the road again next Saturday with another long ride to Aspen for an individual start classic 5K. So far 11 men and five women have qualified for the state meet in Durango on Feb. 21-22.